What is it? Accessible dogfighting and baffling cutscenes, in that order. Aerial combat games can be split down the middle, more or less, according to which half of the '90s they hark back to. Is it an ode to Afterburner, all effortless loops and rolls? Or is it the kind of rigorous flight sim which flew so high in the decade’s latter half, turning a correctly retracted landing gear into a real achievement and almost invariably taking its name from a plane (see Falcon 4.0, B-17 Flying Fortress et al)? 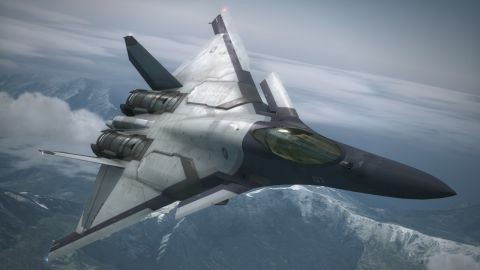 The demands of Ace Combat 7’s campaign are matched perfectly with its accessible approach to flight simulation, throwing improbable machines and scenarios at you simply because it can. Any veterans of the Tom Clancy's H.A.W.X. games (I never did know what that acronym stood for) know how important that marriage of thematic and mechanical approach is: The pseudo-serious Clancy setting prevented those eponymous Hawx from ever getting too ridiculous, and tedium ensued as a result. There's no similar danger here. But is there enough variety? It seems ungrateful to even ask when you've just concluded a mission that requires you to navigate collapsing skyscrapers, but—no, there isn't, really. Despite all the bluster, it’s hard to shake the fatigue that comes with your hundredth dogfight or ground attack. The settings change, and sometimes the environment itself poses a hazard, but in the simplest terms the gameplay loop doesn’t evolve beyond aim, lock, fire. That’s as much a genre problem as anything Ace Combat 7 does wrong in particular, and if you’re reading this review you’ve likely already made your peace with arcade flight sims’ eccentricities. Still, that frustration exists. Let’s not dwell on what’s ultimately a subjective aspect of the game, though. Let’s instead sing Ace Combat 7’s praises for looking great without taxing your PC overly (there’s even a downsampling option, egads!) and for keeping the early '90s arcade flight sim alive, prettier and weirder than ever.